Whereas chess engages students of all learning styles and strengths and promotes problem-solving and higher-level thinking skills: Now, therefore, be it Resolved, That the Senate (1) designates October 8, 2011, as ''National Chess Day''; and (2) encourages the people of the United States to observe ''National Chess Day'' with appropriate programs and activities. 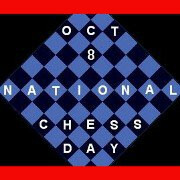 The United States Chess Federation has additional information about The Origins of National Chess Day, and there is also a web site for NationalChessDay.com. If you need to learn more about the game, you can check out our Chess pages, as well as our directory of Chess Books and Chess Software to help teach you the game. We also offer a fine selection of chess supplies such as Chess Sets, Chess Boards, Chess Clocks, Chessmen, and Electronic Chess Games.